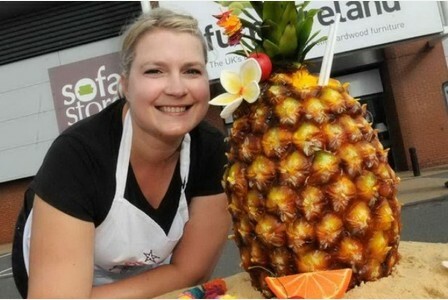 Earlier this month Cakebomber Francesca Pitcher of North Star Cakes brought the tropical sun of Hawaii to Oak Furnitureland Broadstairs. 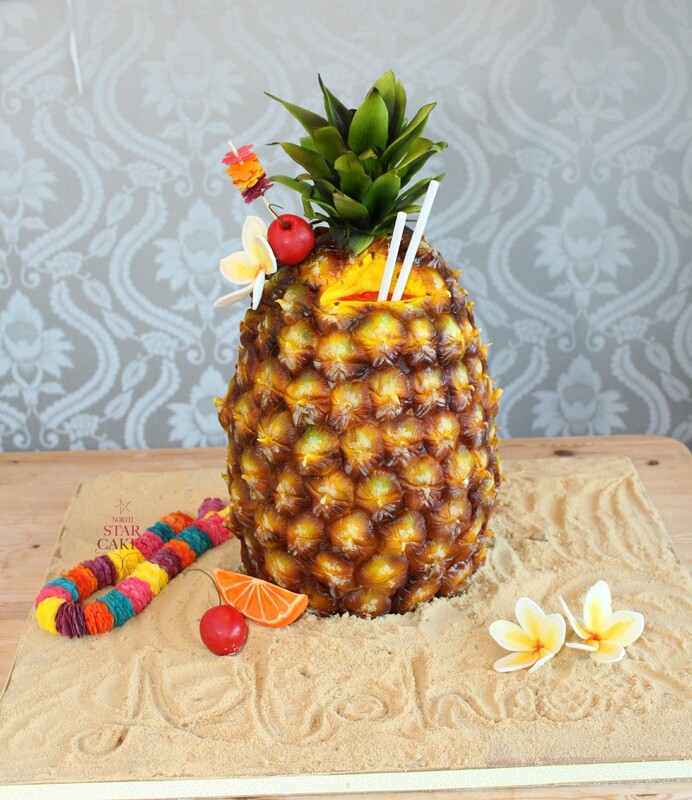 Francesca constructed an oversized pineapple punch cocktail cake which any holiday maker would be thrilled to receive on a sunny beach! The 20 inch tall cake was made in three (very long) days and consisted of 4 large stacked vanilla cakes carved and split with vanilla buttercream, 960 hand made edible rice paper flowers threaded to make a colourful Hawaiian Lei – which took 4 hours on its own to make. The cake was accompanied by oversized frangipani flowers, glacé cherries, an orange segment and the whole cake was placed on a tropical edible ‘sandy’ beach. After the official store opening with the Oak Furnitureland staff and the lady Mayoress the cake was presented to DreamLand Margate, the recently re-opened pleasure beach just down the road from the store. The cake was displayed during the Dreamland Hawaiian Luau event that weekend and cut for the public by one of the visiting Hawaiian dancers at the party. Sounds fun! For more information and further photographs please click this link for the article in the Thanet Gazette.